If you drive long enough, at some point you’re going to end up with bug splats on the front of your car. This is especially true after a long road trip or during certain times of the year when there are a lot of insects in the air, like spring or fall. It’s impossible to avoid and, if you leave the dead bugs on your car for too long, they can harden and possibly damage the paint job. On top of that, nobody wants to drive around with an accumulation of dried dead bugs on their hoods, grilles, windshields and side view mirrors. Unfortunately, cleaning the bugs off of your car requires a little more than just a quick car wash. However, if you choose a method and follow the steps outlined below, you’ll be able to easily clean the bug splats off of your vehicle without causing any damage to the paint job. There are several different types of cleaners that are effective for cleaning bugs off of your car. Regardless of which type you choose, it’s important to use one rather than just water. Bug removers will be able to remove even dried bugs and the stains they leave better than just hot water. WD-40 is also an option and you may already have some in your garage. One of its listed uses is to remove bug splatter on cars. It won’t damage your paint job and does a great job. Dryer sheets can be placed in a spray water bottle with a little bit of water and then sprayed onto the bug-covered areas of your vehicle. It’s a cheap, handy method rather than purchasing a professional bug remover product. Bug sponges are also effective options at removing bug splats from your car. These are specialized sponges designed specifically for this purpose. Tip: When cleaning your car, microfiber towels are a great idea because they don’t leave behind very much lint. After choosing what type of cleaning product you’re going to use, the next step is to start cleaning the bug splats off of your car. Ideally, you should clean your car as soon as the bug splats appear. That way, they don’t have time to dry for too long, and cleaning your car quickly can minimize the amount of potential damage to your paint job. Step 1: Soak bug-stained areas with cleaning product. It’s only necessary to use one of the below methods. Tip: Dampening a towel with cleaning product and laying it over the affected area for a few minutes is a good way to let the cleaning product soak onto the stained areas of your vehicle. Step 2: Clean off the bug splats. 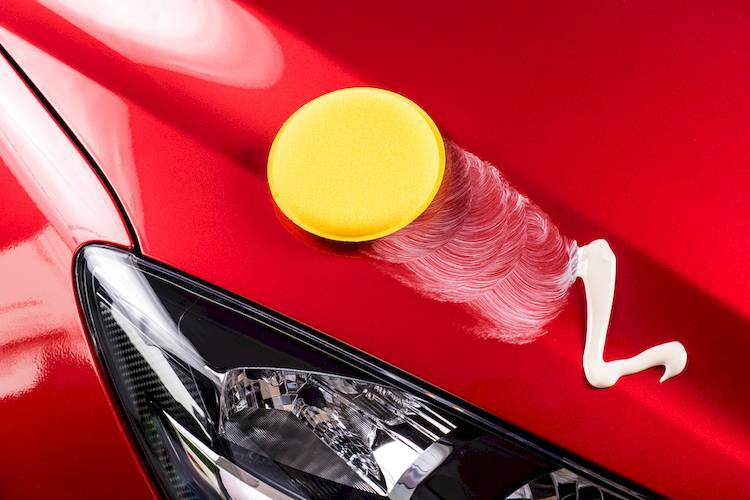 Whether you’re using a microfiber cloth or a bug sponge, after you’ve applied your cleaner, firmly wipe away all of the bug splats on your car. If some splats aren’t coming off very easily, you may consider applying more cleaning product and letting it sit for another minute or so to make cleaning more easy. Tip: When cleaning the windshield, don’t use an oil-based product that will leave residue on the glass. 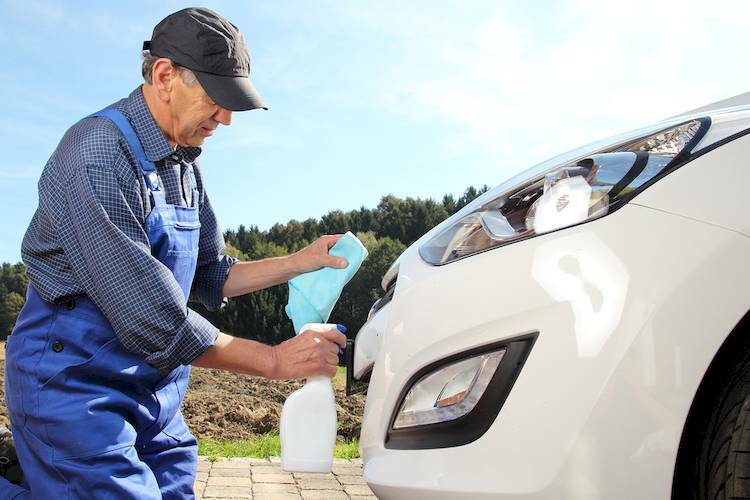 After removing the bug splats, it’s a good idea to give the front of your car (or the entire vehicle) a good wash. That way, there will be no residue left over from the cleaning products, and you can be sure that you’ve removed all of the splats. 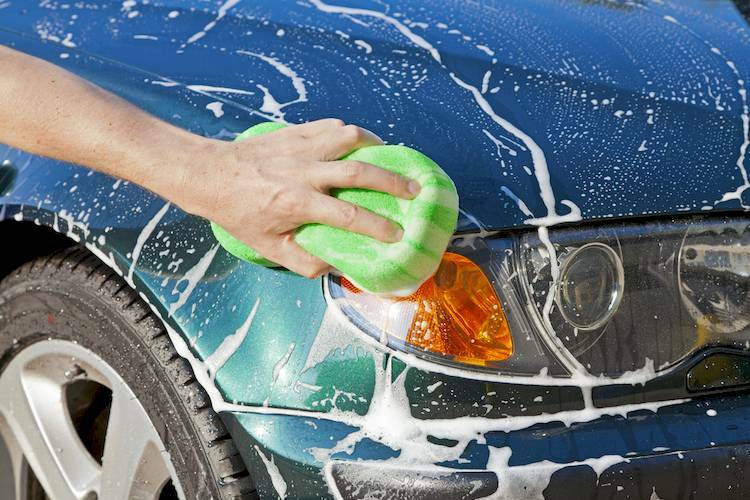 Tip: If you’re manually washing the car yourself (rather than using a car washing service), make sure to use clean towels and a fresh bucket of soap and water to clean the car rather than using the towels you just used to wipe off the bug splats. Applying a car wax solution will make it easier to remove bug splats in the future. The wax coating is easy to clean off and prevents the bugs from hardening directly on the surface of the car. Step 1: Apply car wax. Wipe or spray car wax solution on front of car. A water repellant solution may be used for the windshield and other glass areas, like the sideview mirrors. Be sure to wipe the wax evenly across the surface of your car. Tip: Using a bug deflector shield can minimize the amount of bugs that end up on the hood and windshield of your car. These can be purchased at autoparts stores. Keeping your car clean and free of bug splatter is a good habit to get into. Not only does your car look better but you’ll extend the life of your car. Many bugs give off an acidic substance that can damage your car’s paint and weaken the surface, which can be expensive to repair.